A court in India has convicted 32 people for involvement in the 2002 religious riots in Gujarat state. The court acquitted 29 others in the case known as the Naroda Patiya massacre. 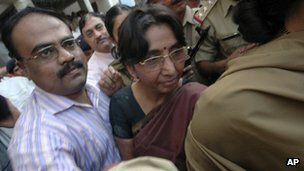 Among those convicted were former minister Maya Kodnani and Babu Bajrangi, a former leader of the militant Hindu group Bajrang Dal. A total of 95 people were killed in the rioting on 28 February in the Naroda Patiya area of Ahmedabad city. Most of the convicted, including Ms Kodnani and Mr Bajrangi, were found guilty of murder and criminal conspiracy, reports said. The trial began in August 2009 and charges were framed against 62 people. One of the accused died during the trial. Ms Kodnani was the junior minister for women and child development in the Gujarat government when she was arrested in connection with the incident in 2009. More than 1,000 people, mostly Muslims, were killed when riots erupted after 60 Hindu pilgrims died in a train fire in 2002. It was one of India’s worst outbreaks of religious violence in recent years. Muslims were blamed for starting the train fire. Hindu mobs eager for revenge went on the rampage through Muslim neighbourhoods in towns and villages across Gujarat in three days of violence following the incident. The cause of the Godhra train fire is still a matter of fierce debate. But a 2005 federal government inquiry concluded that the fire had been an accident – probably started by people cooking in one of the carriages – and was not the result of an attack. Gujarat’s authorities have been accused of not doing enough to stop the riots. Narendra Modi, Gujarat’s chief minister since 2001, has always denied any wrongdoing in connection with the riots but has never expressed any remorse or offered any apologies. A 2008 state inquiry exonerated him over the riots. A special investigation team (SIT) was set up by the Supreme Court to investigate some of the most prominent riot cases.